Great news for readers, travelers, dreamers, and golfers! My publisher is celebrating Map of the Heart with a lavish sweepstakes you don’t want to miss! * This prize must be redeemed for the weekend of August 12-14, 2017. A quick boat trip from the island to the “overseas” farmers market (in Port Orchard, aka Cedar Cove) yielded the first crop of Rainier cherries of the season. They don’t travel well, so I hope you get to taste them, fresh-picked from the orchard. When the berries are in season, make this addictive Romanov sauce. I don’t know why it’s called Romanov sauce, but that sounds fancier than “white gloppy deliciousness” so we’ll go with it. You could use creme fraiche in place of the yoghurt and sour cream, but does anyone actually have creme fraiche on hand? Whip the cream to soft peaks, then blend in everything else. Serve over washed and hulled berries of any variety. If you want to get even fancier, serve over slices of pound cake or ladyfingers. 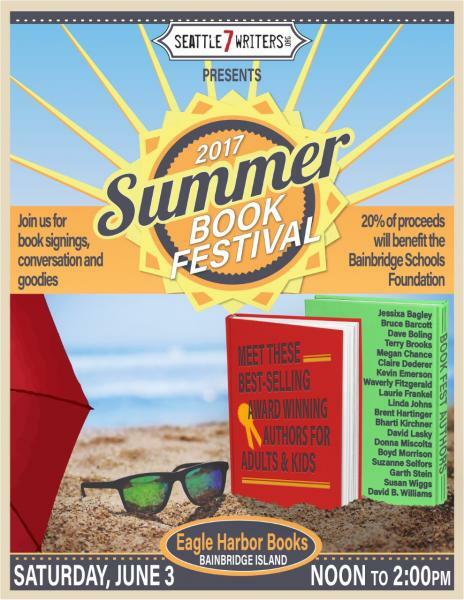 Join us for the 2017 Summer Book Festival! Meet 17 award-winning authors for goodies, conversations, and book signings at Eagle Harbor Books! 20% of proceeds will benefit the Bainbridge Schools Foundation.